In Dumb Question Corner we talk about how to get the shownotes to show up on an iPod Touch or iPhone, and TWO people ask about whether it’s safe to get rid of .dmg files. Soundflower from cycling74.com allows me to pipe Garageband AND my mic into ustream, with the help of Audio Hijack Pro from rogueamoeba.com thanks to the instructions on bwana.org. PictureSync from picturesync.net to help you upload photos to online sites. On Chit Chat Across the Pond Bart and I talk through the 3rd Party Applications that have stood the test of time. Both of us still use: DropBox, CaffineSoundSource, Transmit, FireFox, Twhirl, MagiCal, RapidoWrite, Adium, Skype. Bart also uses: EverNoteNetNewsWire, Teleport, JellyFiSSH, Fluid, ImageWell, Thunderbird, arRsync, Password Vault. Allison also uses: Skitch, Feeder, Firefox 3, Rapido Serial, Camtwist, Quicksilver, AppDelete, Wiretap Studio, SuperDuper, DiskInventoryX, LXVII, Screensteps. Today is Sunday December 28th, 2008, and this is show number 184. I hope you had a great holiday and you’re gearing up for a happy new year. I had a blast going down to see my family in San Diego and then seeing Steve’s family up in Fresno. We basically ate and drank our way up and down the state for four days. It was awesome! The one thing that makes me not dread long drives in the car any more is that we have high-speed wireless the whole way! I know I’ve told you about this before but it just cracks me up what a huge pile of glop I plug together to make this happen. I took a picture of what we plug into the car to make this work, so I put it in the shownotes. Start with the cigarette lighter outlet in the car. Plug in a DC/AC Inverter which gives us a regular AC outlet. One won’t be enough with all the gear we have, so add a 3 outlet surge protector WITH USB ports so you can charge iPods and iPhones. Next plug in the charger for the Cradlepoint, which is the heart of the trick here. 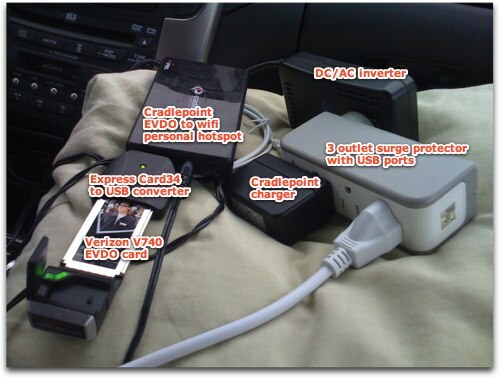 The Cradlepoint takes in my Verizon EVDO card (the V740) and pulls the signal in and converts it to wifi. Well, I have to add more gadgetry there, because the V740 is actually made for the ExpressCard34 slot on the MacBook Pro, and the Cradlepoint has a USB interface, so have a little ExpressCard to USB adapter thrown in there for flavor. Piece of cake, not sure why EVERYONE does this! Six hours from San Diego to Fresno went by in the blink of an eye! Hi, Allison, I listen to you when I can’t sleep – and I still can’t sleep – you’re no help at all! Show notes: How do I view them on my iPod Touch? Do I have to go to the website? If I “leave” a podcast and go online (still on my Touch) does the podcast quit “casting”? I know I could experiment but I’m afraid I’ll miss something because I haven’t figured out how to “bookmark” podcasts yet – but we can save that for another Dumb Question. Hey Kate – did you know i”m from Michigan too? I was born in Detroit and lived in Plymouth then Northville. We sailed out of Travers City and Charlevoix. Well Kate, this one threw me because I go to great effort to create the full shownotes on the web, and the short shownotes for iTunes, the version that gives you the highlights with the urls. Nobody puts the effort into shownotes that I do! If you’re on an iPod (non-touch variety), you just hit the click wheel a few extra times and you get those shortened shownotes. I figure nobody wants to read 30 pages of notes on an iPod, right? you can also get to them by clicking the little “i” in iTunes. I went over to my iPhone and clicked onscreen, and they didn’t come up! I tried it on a few other podcasts and they did come up but most of them showed nothing so it was time to do some research. it turns out that the shows that do show their notes are pasting them into the lyrics field. this is so messed up – not sure why they chose to only display lyrics and not the notes on the iPod Touch and iPhone. Technically I COULD do this for you but here’s why I probably won’t do it. I have a complex workflow that would end up in an infinite loop if I tried to do this! I make my recording, levelate it, bring that AIFF file into iTunes. Then I convert it to an mp3. Then I add the information like the name of the podcast, the category of podcast, and the artwork. Then I upload it to my server. Then I create the podcast episode info in Feeder which includes the shortened shownotes, where I link to the file up on the server. and then I publish. I’d have to circle back with the shownotes and put them back into iTunes, and upload again? I suppose there’s a direct path in here somehow but I’ve got this convoluted path down and I’m kind of afraid to disturb it now! Plus I’m guessing that you actually would want the ENTIRE shownotes which would be way too much data for most people I think. So, I guess Kate there’s an answer to your question but I’m too lazy to do it for you! Excellent question! I struggled with this until I came up with a plan. The way I look at the .dmg installer files is I think about the likelihood that I would use them again if I lost my hard drive and had to reinstall. If it’s an obscure little app that never gets updated, or better yet an app that switched from free to paid for and I want to retain the free version, then I would not only keep the .dmg I’d make sure it was backed up too. In general though I toss them after a bit, pretty much whenever I’m looking to harvest some disk space. Most apps I wouldn’t ever use the old download, I’d just download the newer version after catastrophe occurred. Does that make sense as a process? There were two reasons: (i) the TL has an odd front grill – a little too “Transformer” like; and (ii) Audi’s iPod integration was much better than the Honda/Acura iPod integration. The Honda/Acura approach is to let you only use a few preset playlists from your iPod and they have a hard drive to allow you to load your music onto their proprietary system (I already have my tunes and podcasts on a hard drive – it’s called an iPod – why would I want to reload some CD’s onto another hard drive – one that is in a car!!!! The Audi integration the iPod is pretty seamless and you basically select your music from the console that is 90% like doing it on your iPod. I’m right with Pierre here – it will take a long time for me to get used to the new grill on the TL, it’s the one they started on the MDX and I never really liked! Secondly, I think choosing which $25,000 car to buy based on it’s iPod integration is perfectly reasonable! You think I’m joking but that WOULD make sense to me! Of course, not if it meant I couldn’t go to Honda Bob in my case, but since he’s in Canada then the next most important thing is the iPod integration, right? I forgive Pierre for straying under these trying conditions. Perhaps he’ll teach Acura a lesson this way for the rest of us. Pierre and I went back and forth a few times discussing this – when we bought his 2004 TL it had a CASSETTE DECK of all things! Why wouldn’t they put a plain old audio jack on the front back then? I bought mine in 2005 and they didn’t have the tape deck, but they didn’t have an iPod jack by then either! the iPod had been out for FOUR YEARS by then! It’s very curious that they’re so slow on technology like this. Oh well. licenses numbers stored in yojimbo, but I deleted the disk images long ago. re-installed aps, but I will save that for another dumb question. Well Dave, you coulnd’t have been more timely with your question, AND you and Pierre have proved the whole point behind Dumb Question Corner – if you have a question you think is too dumb to ask, I guarantee someone else has that same question, so it’s NOT dumb! You have an interesting situation where you didn’t keep the .dmg files and now you want to reinstall. In general this will work just fine. The one case where this won’t work is the example where the developer charges for the newer version, or it’s an upgrade from the version you had and there’s an upgrade fee. It’s possible some developers will give you the older version but you’d have to ask them real nice. Ambrosia Software has a very odd model on serial numbers – they actually expire, so having the serial number doesn’t give you a direct route to success, but if you send them your serial number they’ll send you a fresh one. They’re the only vendor I’ve ever heard of that has that goofy process, but it’s bitten me MANY times, where I even had the .dmg file and I still had to contact them to get to a happy place. I’m glad both of you wrote in on the same subject – that was fun! And now a quick word from our sponsors. If you’re ANYTHING like me, and I know many of you are, you can’t help but help other people with their computers. Your friends and family depend on you to give them instructions on all kinds of things from web tool navigation to how to check their email, they depend on you for help. Maybe you even have a blog where you like to post instructions with good screenshots and annotations to clarify things. If you get yourself a copy of ScreenSteps you’ll be able to continue to make them happy while making yourself even happier. With ScreenSteps you get to spend your time writing the instructions and you waste zero time formatting everything, making the words wrap around the pictures, and opening 12 applications to get the arrows and boxes to highlight things on the pictures just right. ScreenSteps has a built in screen capture tool, but you can use the capture tool of your own choice too. Love Skitch? Use it! Love the built in tools in OSX, go for it. All screen capture tools work with ScreenSteps. Then typing in your instructions, hit export and choose from PDF or html, or even publish directly to your own blog or to ScreenSteps live! You can download a free trial of ScreenSteps by going to screensteps.com and when you’re ready to buy make sure you use the coupon code NOSILLA for 25% off! As you’ve no doubt figured out, I’ve been creating the show on Sunday nights live on Ustream.tv. The show is a lot of fun and the chat room seems to enjoy chattering away amongst themselves ignoring me entirely. The one thing they demand is that they get to hear everything I can here. So if I’m playing something in GarageBand, like Victor Cajiao’s Dumb Question Corner music, they want to get to hear it too. Picky I think. This is actually a tricky problem. I’m sending my microphone input through my browser to ustream. how do I also send the output of my sound card to ustream? I don’t have that choice in the menu! I’ve been using WireTap Anywhere from ambrosiasw.com to do this but it’s in a beta stage and kind of hinky and only works about half the time. I thought I had a defined process to follow that would be repeatable, but even that process stopped working after a while. I was really bummed about that, and the guys at Ambrosia have been able to reproduce the error I get so I’m sure they’ll fix it, but for now I needed a solution. BJ suggested I try out Soundflower. And the next week he suggested it again. And again. and again. I kept saying, “yeah, I should try that…” and FINALLY last week I gave it a try. I think I resisted installing it because I had tried it years before and I couldn’t for the life of me figure out why I needed it. NOW I had a mission though – a problem to be solved! I went online and to my delight found out that Soundflower from cycling74.com is open source, licensed under the GNU Public License. That means free too! 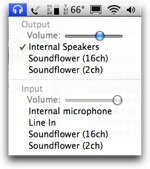 Soundflower installs a Kernel Extension (.kext) so it requires a reboot. My understanding of kernel extensions are something buried very deep in the system, so you don’t want to do a kernel extension unless you’re pretty sure this is a reputable, well tested app. Soundflower has been around forever and comes highly recommended so I proceeded with confidence. Once I had it installed, I didn’t have a clue what to do with it. It’s not an application so I couldn’t launch it, it’s not a Preference pane so I couldn’t get to it through System Preferences. I COULD see it in the Sound preference pane though – it shows up just like any other sound device, like a microphone or a speaker. But what am I supposed to DO with it? I read the readme (I know, crazy, eh?) and it said, “To send the output of one application to another, simply select Soundflower as the output device within the first application and Soundflower as the input device within the second application.” Ok, that makes perfect sense but I need to combine two devices. So, off to the internet to do some research. Luckily I discovered exactly what I needed – Someone named Bwana wrote a tutorial complete with screenshots on how to use Audio Hijack Pro combined with Soundflower to pipe more than one audio source into Ustream. I put a link in the shownotes to bwana.org where you can see the full instructions. The detailed process is critical to success but I won’t repeat that because if you want to do it yourself you can check out Bwana’s blog, but let’s just talk through the high level explanation because that’s probably more interesting anyway. As Bwana explains it, you’ve got a couple of audio sources like say your microphone and Garageband. You hijack the audio using Audio Hijack Pro from rogueamoeba.com. Luckily I bought it a long time ago (it’s $32 by the way). So AHP is the tool that combines the two audio signals into one. But it’s not really a recognized audio source, so that’s where Soundflower comes into play. AHP plays the role of taking in the sound from the Mic and GB, and then you tell AHP to send the output to Soundflower. Since both the mic and GB go into Soundflower, that becomes the one audio source you choose when you finally launch ustream. One of the nice features of the way this setup works is that you actually control the sound levels of what goes into ustream using AHP. The reason you care about that is that for some reason GB is REALLY loud when it gets to ustream, no idea why, but if you turn down GB so it doesn’t blow out the listener’s ears, it’s really really quiet for you. With AHP you can turn GB down for them but it stays a good volume for you. Soundflower combined with Audio Hijack Pro is a perfect solution – now everyone’s happy! Thanks BJ, thanks Ambrosia, Thanks open source developers, and thanks Bwana for making the instructions for me! Ok, here’s the problem. I love sharing my photos online. No, that’s not the problem, that’s the fun part. I love sharing them on Facebook and on Flickr. Ok, I don’t love Flickr but I’ve begrudgingly been trying to use it for my better photos, reserving Facebook for the family and friends snapshots. This was all good for a long time, but somewhere along the line things started to get hinky. I actually remember the day – I was at a hotel in Boston for the Enterprise 2.0 conference and I tried all evening to upload photos to Facebook and they simply would not go! I used the Facebook Uploader that hooked into iPhoto and I was able to select photos, click a button, name the album, tag the photos, write captions, and click upload and in a while all my photos would be online. That day though, only ONE photo would go up. I struggled for a long time, then tried using the Java uploader on the Facebook site, and it would sometimes work. Then I tried switching to Safari from FF and it would sometimes work. I was aggravated every time I tried to upload photos. I finally was able to settle into a clumsy pattern where I would change my default browser to Safari and I could upload to FB. Problem though is that Adium using Facebook Chat and Safari are somehow incompatible, so if I had Adium open, Safari would log me out of Facebook! Argh! So to get my pictures up I have to open Safari, open prefs, change to Safari as my default browser, quit Adium, launch iChat and THEN I can upload pics. And of course reverse all that to get back to Adium and Firefox when I’m done. I should mention that this exact same problem occurs with Flickr. I wrote to one of the message boards I like and my buddy Charlie had found a link to an app called PictureSync from picturesync.net that’s supposed to aid in uploading photos to all kinds of online services. I’m not going to list all of the services they support, but here’s a sampling – Facebook, Flickr, Fotki, ipernity, Webshots, Smugmug, Kodak Gallery – the list goes on and on. They have desktop integration with iPhoto AND Aperture (yay!) 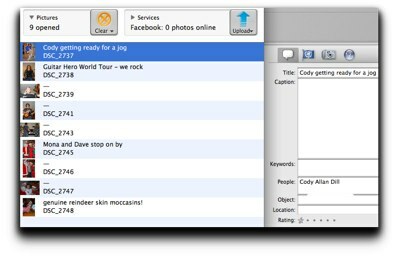 along with Lightroom, Expression Media iView Media Pro and they even support drag and drop. As I dig into this app, the most important thing for me will be wether I can actually upload photos, but for the rest of you who don’t seem to be impaired in this way, I’ll try to look for advantages over the uploaders you can already plug into Aperture or iPhoto. Since PictureSync syncs with so many services, they have made an interesting pricing model. If you just want it for one service, the software is free. If you want to use it on multiple services, it’s only $10. If you use pro apps like Aperture and Expression Media, it’s $20. I think that’s a little bit odd – because I paid more for Aperture I should pay more for PictureSync? Maybe they did it because the market for those apps is smaller, and they did have to write the integration in for those apps, so the price goes up. That makes more sense to me, ok, I’m at peace with it. Ok, enough yapping about problems and pricing, let’s play! When PictureSync first comes up you have to set up the service to which you want to upload pictures. Open the Accounts window, and click on the Add button at the button and name the service anything you like (I chose to call it Facebook). The click on Next, and then click Authenticate. PictureSync will open your browser to the appropriate service where you enter your username and password, and then give PictureSync the authority to mess around in your account. The one thing that confused me was that I had to go back and authenticate again when I went to use PictureSync at a later date. I guess that makes sense though, might be some sort of security hole or something to just let it stay connected. Now let’s add some pictures. I selected 9 photos over in Aperture, and then in PictureSync I used the pulldown to choose selected pictures. It brought the 9 photos in, and a drawer opened on the right giving me the option of adding TONS of info about the photo. There’s actually 4 tabs of options – the first tab lets you add title, caption, keywords, people, object, location and rating. The second tab is related to geotagging I think because it has event, categories, and then a bunch of city/state/latittude/longitude kind of stuff. There’s even a Google Earth pulldown where you can pull the location from there. You can put a copyright and your name as author on the photos too. (I’m only 2 tabs in, mind you). Next up it shows you the camera settings using the EXIF data – that’s the stuff people who actually know how to take photos use – like exposure, resolutionUnits interopindex, you know, the usual stuff! It wasn’t clear to me what I was supposed to DO in this tab, it was just kind of a listing of data about the photo. The 4th tab was empty with the symbol for the interwebs on top. Confused at first, I hovered over the emptiness and it told me that this will get populated AFTER I upload photos – it actually keeps TRACK of what you’ve uploaded where. Remember I said I’d keep an eye out for advantages of PictureSync over other options? that’s one for sure. One thing I wish I could figure out is how to enter meta data on PictureSync and have it show up in the right place on Facebook. In PictureSync you can annotate the photos as I said with all kinds of fields, but they aren’t going into the right place on FB. The name of the photo in Aperture is that goofy name the camera companies give on the memory card, like DSC5324 if it’s a Nikon camera. I can change the name of the photo in Aperture (they call it changing the name of the version) but that doesn’t change it in the upload to FB. PictureSync puts the name of the original in the caption instead, and it maintains the DSC5324 even if you change the caption in PictureSync. It DOES put the caption in, but AFTER it puts in that annoying DSC name too. If you put something as the title in PictureSync, then it puts that as the caption in FB. Very weird, and unhelpful. I looked in their support pages and they’ve got an extensive meta data mapping page, but for the life of me I couldn’t follow what they were talking about. They were describing variable names with dollar signs in them for example. I wrote to Jacob at PictureSync and asked him about these scary variables, and he admitted that they ARE scary. I felt better then! He explained that if I only ever want the caption on FB, then I can open the settings for the Facebook Account I set up in PictureSync, and change the description variables. As soon as I looked at it in there I GOT what they’re doing here. The Description field in the annotations setting is defaulted to $title$caption. All I have to do is get rid of $title, and then I’ll never see those annoying DSC titles on all my FB pics! If I choose to put in a caption in Aperture, then IT will show up in the caption field of Facebook. One of the coolest things about FB is how you can tag people in photos, which triggers a message to them that they’ve been tagged, which tricks them into coming over to see your photos. I can’t find a way to do the tagging in PictureSync. I tried using the people field, but it didn’t do anything at all. Really wish it could do this, because if I upload to FB and then tag from in there, people frequently see the pics before I can even get in there and tag them myself! I sound like I’m whining here, but I really love PictureSync because it’s WICKED fast! The default for FB is to resize the photos to 604 pixels wide before uploading, which is the max size you can have on FB anyway. Somehow it’s changing the photo size and uploading in about 1/10th the time it was taking me using the FB uploader plugin for Aperture! I’m talking 20 photos in maybe a minute? it’s crazy how fast it is! Another problem with digital photo uploads is photos you’ve taken in portrait mode instead of landscape, you have to go rotate them somewhere in the online service. Get this – PictureSync takes care of this automatically for you! Very cool feature, I tested it and it worked perfectly with no intervention on my art. If you’re crazy about a lot of photo sharing sites, you can set them all up in PictureSync and hit upload just once and it will upload to ALL of your sites at the same time! I sort of segregate my pics – FB is for snapshots of people, Flickr is for my more interesting photos of stuff instead of people, so I probably woulnd’t use this feature too often but I bet a lot of people would really like that, and again that’s a big plus over other uploaders. I started having a script error on connecting to Facebook today with PictureSync but I’ve had so much hinky behavior there I’m hoping it’s not a problem with PictureSync. I sent a note off to Jacob this morning so I suspect if it’s on their side he’ll have a fix out to me right quick. Again, I ASSUME it’s on my side in this case! So bottom line – if you’d like wicked fast uploads to multiple online photosharing sites, auto photo rotation, the ability to control what content goes towhich services, and the ability to tell what you’ve loaded where after the fact, and you’d like it all for only $10, then PictureSync is a really cool app. If you only want wicked fast to ONE service, then download the free version and have at it! If you’re like Pierre and live far away from Los Angeles and Orange County, then I guess it doesn’t matter what kind of car you drive. I would probably still buy a Honda if I lived far away because I’ve had such great luck with them over the years, but I’d always wonder if the reason I had such great luck was because Honda Bob has taken care of every Honda we’ve owned. I think we’re up to about 8 cars now, and we have great resale value on them every time. Part of that is due to the wax jobs I do on them of course, but an even bigger contribution is Honda Bob’s regular maintenance. If you’d like to have superb, trustworthy work done on your car by a mechanic with 30 years of experience dedicated to Hondas and Acuras, then you should give Honda Bob a call at (562)531-2321, or shoot him an email at hdabob@aol.com. He’ll come to YOUR house or YOUR work at YOUR convenience and do a great job. Tell him Allison sent you! HDA Bob’s Mobile Service is not affiliated with Honda, Acura or Honda Worldwide. The week after next is MacWorld as you all know, and I’m excited to announce that we will be doing a live episode of the Mac Roundtable from the exhibit all show floor! If you’re at the show, be sure to come by, we’ll be on from Wednesday 7th Jan at 4pm! Hope to meet some of you there. Well it’s time to sign off now, let’s sing it altogether now – email me your praise, complaints and dumb questions to allison@podfeet.com, or if you want to send an audio recording along, you KNOW I love those (when they’re 3-5 min long), shoot that to my gmail address at nosillacast@gmail.com. Follow me on Twitter too at twitter.com/podfeet. Thanks for listening, and stay subscribed. Agree with Bart on Fluid. What I love is that the apps you also convert your apps into menu bar apps. So websites I access all the time i have them in my menu bar to keep from cluttering dock and windows. Also agree with Bart on Evernote and NetNewsWire. Over the last 7 years I have used lots of RSS readers and NetNewsWire is hands down the best one. Great interface, lots of options, and the synching and the iPod Touch app make it perfect. Yeah GoogleReader and other web based RSS readers give you the same synching, but I got a Mac because I love beautiful and well crafted software. Agree with Alison on Skitch and AppDelete. Skitch is just plain awesome freeware and fun to boot. I also like DropBox, Caffine, SoundSource, Transmit, FireFox, MagiCal, Skype, But use TweetDeck instead of Twirl since it has great grouping capabilities. Use TextExpander over RapidoWrite since I had problems with RapidoWrite always working everywhere I wanted it to work. The latest TextExpander just works. The latest version of Pathfinder gives me Finder on steroids and the power I was use to with file managers in Windows. I love Pathfinder. AppFresh is great to keep all program up to date. As a lover of books Bookpedia was an answer to my book cataloging dreams. I prefer it over Delicious Library because it focuses on a single task and does it extremely well with lots of options to import/export and it has an iTunes App store app. The wish list part of it is excellent. iClipboard. I had been looking or a clipaboard app and this one went on sale and so I got it. Very simple, but retains formatted words and images. Just what I wanted. I use to use the freeware app JumpCut and it is great for just retaining text. MainMenu. I have three monitors on my 2008 Mac Pro and MainMenu lets me access menu bar shortcuts without moving my mouse all the way over to the menu bar. Surprised you didn’t have 1Password on the list. I bought it earlier this year when it was on sale and love how it works with every browser I use. Plus the iPhone/IPod Touch version is quite useful Plus now you can select an Agile keychain and you can have it sync to dropbox so you never have to worry about losing your passwords. As a switcher I still use VMWare Fusion, but pretty much only for work stuff since I am a Visual Studio programmer. If I didn’t have to use Visual Studio I could easily go all Mac. Everything I use to use on Windows I found a better replacement for in OSX. Pluto is a cool menu bar app that just stores text. I use it for text that I use only once in awhile and don’t want to assign a keyboard shortcut to in TextExpander. FStream. Great freeware app to listen to and record internet streams. Simple but it works. Open Office 3. Now that it is written in Cocoa and supports Aqua it is quite excellent and I never use Microsoft Word anymore even though I have an MSDN account. Aptana Studio – excellent freeware programmers editor which is great for xml, css, and multiple languages. Use to use Komodo Edit which is also quite good.